You’ve seen the barges and draglines shuttling dirt from place to place for weeks now. 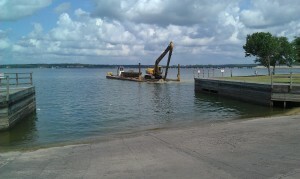 Homeowners along the shoreline are taking advantage of the decreasing lake levels to deepen their channels to the lake. For many, the dredging is the only option to use their boats at all. Others have removed their boats from the shallows of their docks to deep water marinas or dry storage on land. Many boats are already permanently marooned to “hang in the wind” until the drought of 2011 ends. Anticipating even greater drops to come, a couple marina and direct access boat storage businesses around the lake are busy upgrading and deepening the access to the lake for their tenants. Before the beginning of summer, The Palms Marina at the end of FM 830 expanded one of their boat ramps to provide launching access in water 6 foot or more below normal pool levels. And E-Z Boat Storage on the main body of the lake is conststantly dredging from their already deep launch to the reach the lake anticipating a 4 foot or more drop to come. Knowing that Lake Houston is running out of water to supply the City of Houston with drinking water, Lake Conroe is sure to begin helping funnel water into the Lake Houston water plant. With that in mind, and no end in sight to the current drought conditions, users and businesses of Lake Conroe need to adapt to the changing conditions. The surface area of the lake is already diminishing and sandbars are appearing in several locations. With shorelines creeping below bulkhead bottoms, watch for a calmer and smoother boating experience. At low lake levels, Lake Conroe can have pleasant surprises to those with an open-mind!